VANCOUVER, British Columbia, Oct. 10, 2018 (GLOBE NEWSWIRE) -- FIREWEED ZINC LTD. (“Fireweed” or the “Company”) (TSXV: FWZ) is pleased to announce further drill results from its 2018 drill program on the Macmillan Pass Project in Yukon, Canada. Results from drill hole TS18-004 were previously reported from the Tom East Zone and included 21.1% zinc, 13.5% lead and 243 g/t silver over 16.41 metres (see Fireweed news release dated September 20, 2018 for details). Drill holes TS18-001 and TS18-006 both intersected a fault zone and did not test the Tom West mineralization. TS18-005 and TS18-008 were drilled in the high-grade, feeder-proximal, south end of Tom West. These holes infilled an area that was previously drilled in 1970 from underground exploration drifts using small diameter core (30.1 mm AX) with significant intervals of core loss and poor recovery resulting in unrepresentative low grade results. Modern triple-split tube drilling in 2018 ensured that recoveries were excellent within the reported intersections: 92.9% and 94.9% average recovery in holes TS18-005 and TS18-008, respectively, and higher grades. Results from drill hole TS18-004 were previously reported from the Tom East Zone and included 21.1% zinc, 13.5% lead and 243 g/t silver over 16.41 metres (see Fireweed news release dated September 20, 2018 for details). Drill holes TS18-001 and TS18-006 both intersected a fault zone and did not test the Tom West mineralization. 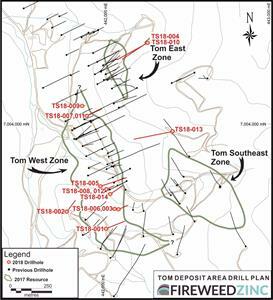 TS18-002 was a step-out hole, testing the down-dip projection of the Tom West Zone, outside the boundary of the current Mineral Resource. The hole intersected 12.57 metres of laminated sulphide-barite mineralization grading 4.33% zinc, 0.14% lead, and 1.3 g/t silver. TS18-003 was drilled as a large, 90 metre step-out hole from the nearest mineralized hole. The hole passed through a major fault and encountered a small section of very high-grade mineralization truncated on the far (east) side of the fault. 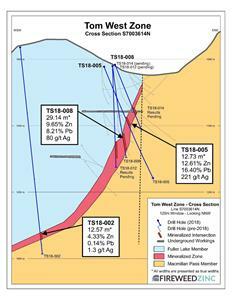 Together with information from holes TS18-001 and TS18-006, which intersected the same fault, Fireweed is now in a position to target step-outs in the high grade part of Tom West on the western side of the fault, and pursue the upside of the untested mineralization on the eastern side of the fault. A historic 1990 drill hole, TS90-012, confirmed the presence of significant mineralization on the eastern side of the fault with an intersection outside of the area of the current Mineral Resource, grading 8.4% Zn, 1.2% Pb and 3.5 g/t Ag over 37 metres including a zinc-rich zone of 14.1% Zn, 0.2% Pb and 1.2 g/t Ag over 14.6 metres. TS18-007 was drilled adjacent to historic 1951 hole TS001 at a slightly steeper angle. Higher grades over a thinner interval of mineralization were encountered in this 2018 hole. Assay results from additional drill holes at Tom West, Tom East and End Zone are still pending (see table at end of this news release). The drill core logging and sampling program is carried out under a rigorous quality assurance / quality control program using industry best practices. Drill intersections are all HQ3 (split tube) size core (61.1mm / 2.4-inch diameter) with recoveries typically above 85%. After drilling, the core is logged for geology, structure and geotechnical characteristics, marked for sampling, and photographed on site. The cores for analyses are marked for sampling based on geological intervals with individual samples 1.5 meters or less in length. The core is cut in half lengthwise with a rock saw at the core facility on site, with half-core samples bagged and sent by reliable transport to the laboratory, and the other half-cores are stored on site for future reference. Intersections selected for metallurgical testing are cut in half with a rock saw and then quartered; one quartered core is archived on site, one quartered core is sent for assay, and the half-core is sent for metallurgical testing. A total of 5% assay standards and 5% blanks are inserted into every sample shipment as a quality control measure and, after analyses were received, were found to be acceptable. Samples are sent to the Bureau Veritas (formerly Acme Labs) preparation laboratory in Whitehorse, Yukon where the samples are crushed and pulverized to 85% passing 200 mesh size pulps. A 250-gram split of each pulp is then sent to the Bureau Veritas laboratory in Vancouver, B.C. and analyzed by 1:1:1 Aqua Regia digestion followed by Inductively Coupled Plasma Mass Spectrometry (ICP-ESI/ICP-MS) multi-element analyses (BV Code AQ270). All samples are also analyzed by lithium borate fusion and X-ray fluorescence analysis (XRF) finish (BV Code LF725). Over-limit Pb (>25.0%) and Zn (>24.0%) were analyzed by lithium borate fusion with XRF finish (BV Code LF726). Silver is reported in this news release by method AQ270, and zinc and lead are reported by LF725 or LF726. Bureau Veritas (Vancouver) is an independent, international ISO/IEC 17025:2005 accredited laboratory. On March 22, 2018, the Company announced the appointment of Mr. Neil MacRae as Manager of Investor Relations. Further to that announcement the Company is required to also report that Mr. MacRae was hired on a minimum one year contract starting March 15, 2018 at $6,000 per month and granted 100,000 stock options with an exercise price of $1.45 per share and an expiry date of March 14, 2023. Technical information in this news release has been approved by Gilles Dessureau, P.Geo, Vice President Exploration and a ‘Qualified Person’ as defined under Canadian National Instrument 43‑101. About Fireweed Zinc Ltd. (TSXV:FWZ): Fireweed Zinc is a public mineral exploration company focused on zinc and managed by a veteran team of mining industry professionals. The Company is advancing its large 470 km2 Macmillan Pass Project in Yukon, Canada, which is host to the 100% owned Tom and Jason zinc-lead-silver deposits with recently announced Mineral Resources and a PEA economic study (see Fireweed news releases dated January 10, 2018 and May 23, 2018 respectively and reports filed on www.sedar.com for details). The project also includes option agreements on large blocks of adjacent claims (MAC, MC, MP, Jerry, BR and NS) which cover projected extensions of mineralization from the Jason area and areas where previous exploration identified zinc, lead and silver geochemical anomalies in critical host geology. Additional information about Fireweed Zinc and its Macmillan Pass Project, can be found on the Company’s website at www.FireweedZinc.com and at www.sedar.com . ON BEHALF OF FIREWEED ZINC LTD. This news release may contain “forward-looking” statements and information relating to the Company and the Macmillan Pass Project that are based on the beliefs of Company management, as well as assumptions made by and information currently available to Company management. Such statements reflect the current risks, uncertainties and assumptions related to certain factors including but not limited to, without limitations, exploration and development risks, expenditure and financing requirements, general economic conditions, changes in financial markets, the ability to properly and efficiently staff the Company’s operations, the sufficiency of working capital and funding for continued operations, title matters, First Nations relations, operating hazards, political and economic factors, competitive factors, metal prices, relationships with vendors and strategic partners, governmental regulations and oversight, permitting, seasonality and weather, technological change, industry practices, and one-time events. Additional risks are set out in the Company’s prospectus dated May 9, 2017 and filed under the Company’s profile on SEDAR at www.sedar.com. Should any one or more risks or uncertainties materialize or change, or should any underlying assumptions prove incorrect, actual results and forward-looking statements may vary materially from those described herein. The Company does not undertake to update forward‐looking statements or forward‐looking information, except as required by law.